AML's 2001 Validation of Double-HelixTM Magnets. Left to right: Rob Gibson, William Hinson, and Dr. Rainer Meinke. Photo courtesy of Advanced Magnet Lab, Inc./PR Newswire. MELBOURNE, Fla.–AML Superconductivity & Magnetics, a developer of magnet-based applications, recently announced the global recognition of its Double-HelixTM technology, including by the Lawrence Berkeley National Laboratory (LBNL) in the United States and the European Organization for Nuclear Research (CERN) in Europe. Initially invented in the late '90s by a team led by AML CTO and Co-founder Dr. Rainer Meinke, Double-HelixTM magnet technologies today include a comprehensive and growing intellectual property portfolio, including 14 active patents comprising more than 100 invention claims. "Our IP includes enabling geometries and the implementation and manufacturing pathway for a family of novel magnetic solutions," said Meinke in a press release. "This pathway led to enabling superconducting and copper-based magnet solutions with new 3D printed material-based solutions in development. 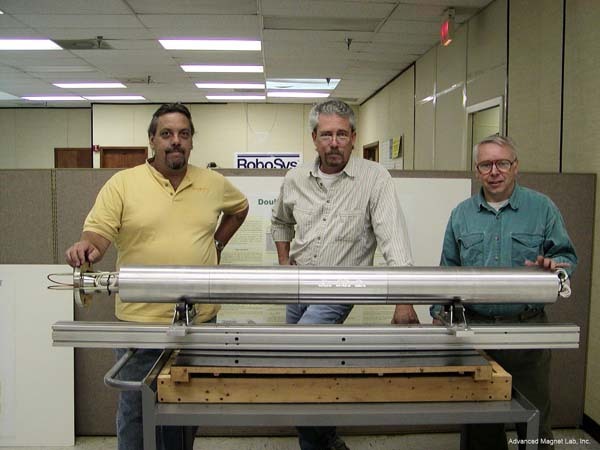 We produced, tested, and validated this at the Brookhaven National Laboratory in 2001." At the core of AML's application development process is CoilCADTM. CoilCADTM is a proprietary design and manufacturing software platform that is said to dramatically accelerate time to market. It does so by exactly converting a specific, theoretically "perfect" magnetic field of virtually any shape, into a fully functioning reality. As a result, magnet-based products can achieve unprecedented capabilities and performance, according to AML. Private and government organizations have sought out Double-HelixTM for numerous applications, including motors and generators, charged particle beam optics for particle acceerators, and cancer treatment, such as proton and carbon therapy. "We are extremely proud and excited to have the international science community independently validate our technology and its high value to society and industry," said Mark Senti, CEO and co-founder of AML, in the release. "The fact that others have tried and failed to patent our configurations proves the commercial value of this technology,"
AML (www.AML-Enabled.com) has carefully developed and streamlined the process for research and industry participants to license and utilize AML's solutions for high-impact applications. "The path to manufacturing these magnets goes through AML; we're here to be your partner for enabling and game-changing applications," said Senti. Advanced Magnet Lab, Inc. (AML, or AML Superconductivity and Magnetics) works at the leading edge of the development of innovative products for energy, medical treatments, and the environment. The company, founded in 1995, said that it combines unique expertise with proprietary design software, magnet technology, and manufacturing processes. Validated by the U.S. Department of Energy, NASA, international laboratories, universities, and large corporations, AML aims to enable breakthroughs for medical diagnostics and treatments, electric-powered transportation, power generation and use, and scientific research.